Why Is There Algae In My Pool—And What Can I Do About It? If your pool is “seeing green” and you’re wondering how you can get algae out of your pool—and why it’s happening in the first place!—you’re certainly not alone. And let’s face it, no one wants to plunge into a pool with green-tinged water or telltale dark spots on the walls that indicate black mold. The challenge is, because of the tropical climate in South Florida and The Keys, all plants (including bacteria) are constantly growing. The moist, warm air is a ripe environment for algae. Not to mention, there are a number of factors within your pool that can cause algae. Remember, your pool is a delicate system that demands proper balance for clean, healthy water. So, why is their algae in your pool water, and what can you do to get rid of it? Let’s talk about some common algae triggers and how a pool professional can take care of the problem. Is Pool Algae Common—Can I Swim Anyway? 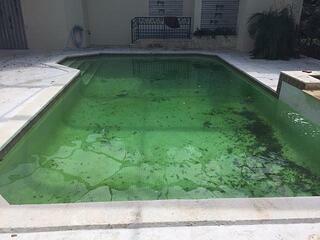 What’s important to know is this: Most South Florida pools do get algae at some point in time. You should avoid swimming until algae is removed because it’s never a good idea to swim in pool water that is not properly balanced. The good news is, when a professional pool provider such as Reef Tropical maintains your pool weekly (or more often than that), you won't have to worry about algae. Why Is There Algae in My Pool? There are several factors that trigger algae growth, and in order to find out the reason why algae is growing your pool, a pool maintenance professional will need to evaluate the situation. Here are the four main reasons why algae forms in pools. Improper Filtration: If your pool filter is not properly cleaned it will not trap debris and bacteria. And, if the pool filter pressure (psi) is off, the filter might not be pushing enough water through the filter—and that constant water movement prevents algae from forming, aside from contributing to the overall water quality in other ways. Phosphates: Basically, phosphate is oxygen in the water—and plants (like algae) need air to thrive. 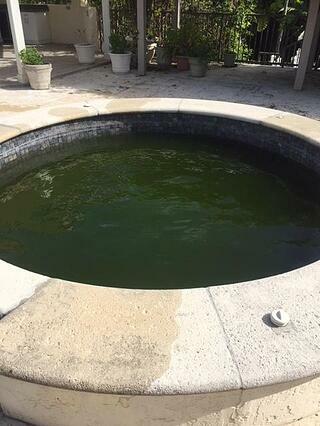 So, when a pool contains phosphates, algae will form. pH Imbalance: The ideal pH level for pool water is 80 to 120 parts per million at its peak, depending on the pool surface. When pool water is too acidic (pH is low), chlorine is used up at higher rates. Chlorine is most effective in acidic water—so when the water is too acidic, it uses too much chlorine. That can leave your pool with inadequate chlorine levels if the water isn’t monitored carefully. When water is too alkaline (pH is high), it can impact the balance of other chemicals in the water. While alkaline water alone doesn’t tend to trigger algae growth, it’s an indication that the pool is off-balance—and that opens the door for algae. Stabilizer: Stabilizer (cyanuric acid) extends the life of chlorine by slowing the breakdown of chlorine molecules. (The sun naturally breaks down chlorine, as does overly acidic water.) 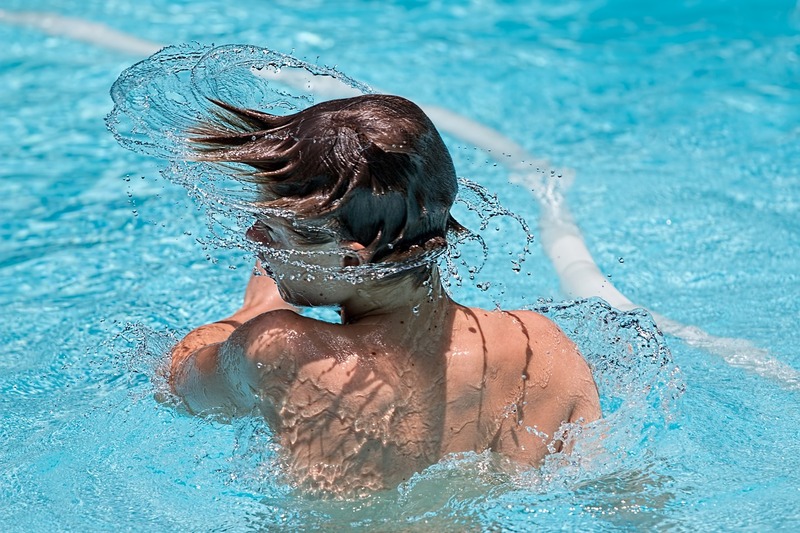 When the pool is lacking stabilizer, chlorine breaks down more quickly and chlorine levels could drop faster than expected. This creates a window of vulnerability where the pool could then form algae. You’ve got algae in your Florida pool. So, now what? A pool professional will use a specific process for getting rid of algae that begins with mechanical action—physically brushing the pool to remove algae from the pool surface and get it into submersion. If chemicals are added without brushing the pools walls, they will not be as effective. It’s important to note that the high-quality pool pumps and filtration systems work to your advantage because they’ll do a better job of removing algae (not to mention, preventing it), and maintaining proper water pressure. After brushing, the goal is to lower the pool water pH so it becomes acidic, so chlorine can be especially effective. Then, chlorine and an algaecide are added to the pool water. The purpose of this regiment is to bring the pool water into an acidic state where it can be “shocked” by chlorine (which attacks algae) and an algaecide. Remember, you can’t just skim algae off the surface after you brush it from the pool walls because the microscopic particles fall right through mesh. Most of the time, this algae removal method works effectively right away. We always return to the pool the next day to check on the progress and get a reading of the pool chemical levels and pH. However, if algae continues to be a persistent problem, and we already ruled out other issues such as a faulty pool pump, dirty filter or imbalanced water chemistry—then phosphates are likely the culprit. A phosphate test will tell whether phosphates need to be addressed by using special chemicals. Your pool is a delicate ecosystem, and the proper pH, chemical balance and effective equipment are critical for ensuring safe, clean pool water. If algae is a problem in your pool, it’s time to dig deeper and find out the root cause. Because of the variables involved in keeping pool water balanced, it’s critical to enlist in a professional pool provider to regularly maintain your pool—and to prevent issues like algae before they become a problem. We want to answer your questions about keeping a clean pool and hiring a professional pool service in Miami and The Keys. How can we help? Call us any time at 305-367-2005, or fill out this simple contact form and we’ll get in touch with you.